In all seriousness, BIG thank you to Kristen over at Just Live Simply for choosing me to be a part of this Stylish Blogger Award. It feels good to finally be a part of this awesome Blogosphere! I just love all of the great people and creative blogs I've encountered. Reading everyone's ideas, thoughts & creations, has really inspired me, so thank you! So I guess to play along with this award I just have to post 7 things about myself that you probably don't know. 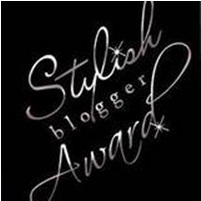 Then, I get to pick 15 other stylish bloggers to share the award with. :) Fun! 2. I have an irrational fear of zombies. Vampires, werewolves...I can handle, but there's something about those creepy brain-eaters that give me the heebie-jeebies. Zombieland has been on my DVR for months because everyone says it's hilarious, but I just can't bring myself to watch it. 3. I lived in Germany with my husband for 3 years. And it was amazing! 4. I'm a little bit addicted to cloth diapers. 5. I'm currently working on my degree to become an English teacher. 7. I am a total beach bum. And of course, if you haven't checked out Just Live Simply, you should! Thanks for including me! I laughed about your small addiction to cloth diapers - I have one too! Wow, thanks for the shout out! I, personally, feel that your blog is much more stylish and put-together than mine. Congrats on your award! how fun learning more about you : ) i also cloth diaper, but lately it's been feeling like a big ol' chore for the first time. i miss being able to line dry them in the sunshine during the summer! I'm a total beach bum too. Well not literally considering I live in Southern Arizona buuuut I used to be when I lived in San Diego. Ha! I'm your newest reader, hooray!